Preview MP3 files by clicking on the links below. 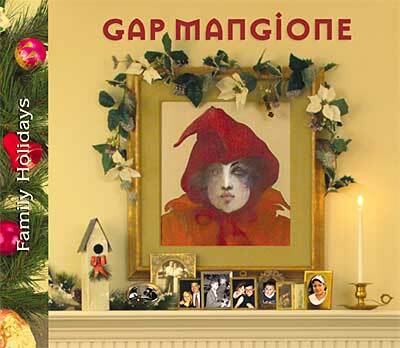 All arrangements by Gap Mangione except “Santa Claus Is Coming To Town,” “The Way We Celebrate New Year’s,” and “Carol of the Bells.” by Grant Geissman; “Sweet Cheryl Lynn” adapted from the arrangement by Chuck Mangione; “What Are You Doing On New Year’s Eve” adapted from the arrangement by Rob McConnell; and “Silent Night” by Andy Weinzler. The Big Band players; Steve Gadd; Tony Levin; Gerry Niewood; Grant Geissman; Larry Swist. To Gary Polisseni, for making this possible; Peter Morticelli; Dan Hanley; Peter Heinrich; Jon Heinrich; Peter McCrossen; The Lodge at Woodcliff; To Ramón Santiago (1943-2001). And to my wife Janet; my son Jason Mangione; my daughter Ardis & Steve Lindley. To my grandson Kidder Jay Lindley for the love in your smile and in your eyes. and to Mom on her 90th, with love. Some of the titles on the CD have seemed mysterious to others, so I thought I'd reveal the reasons for their inclusion. Carol of the Bells Holiday/Family: It is Janet’s favorite holiday song. The Way We Celebrate Holiday: Any holiday lyrics that refer to Charlie Parker and bebop must be included.